Subject: YOUR E-MAIL ADDRESS WON THIS YEAR LOTTERY. YOUR E-MAIL ADDRESS WON THIS YEAR LOTTERY. our computer balloting sweepstake Lottery held August 15, 2007.
been approve for the star prize of (?1,000 000:00) One Million Euros Only . information in all your correspondence emails with your claim agent. 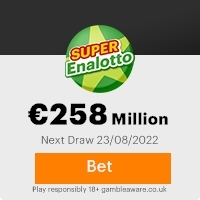 in our next  year Thirty Million Euros lnternational lottery. Previous: Your Email Addres Has Won AwardFresh ScamsNext: YOUR EAMIL WAS SELECTE ... ON!!! This Email with the Subject "YOUR E-MAIL ADDRESS WON THIS YEAR LOTTERY." was received in one of Scamdex's honeypot email accounts on Thu, 23 Aug 2007 00:10:32 -0700 and has been classified as a Generic Scam Email. The sender shows as LOTERIAS NACIONAL AWARD 2007 <louisvincent@onetel.com>, although that address was probably spoofed. We recommend that you do not attempt to contact any persons or organizations referenced in this email, as you may expose yourself to scammers and, at the very least, you will be added to their email address lists for spam purposes.